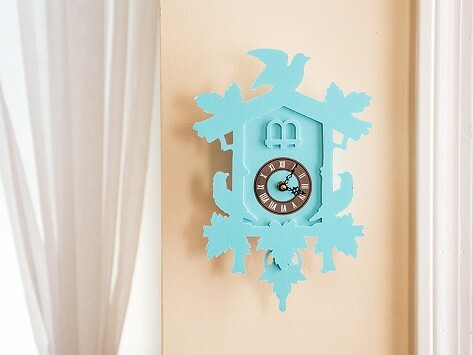 FunDeco’s Flew the Coop No Cuckoo Cuckoo Clocks give new meaning to “fun décor.” These modern cuckoo-less clocks feature a real quartz clock surrounded by a lightweight, environmentally sustainable paperboard frame. Made in the USA with a quirky take on baroque style, FunDeco clocks look great in dorm rooms, kids’ rooms . . . anywhere there’s room for fun. Vintage-inspired "Flew the Coop No Cuckoo Cuckoo Clocks"
Dimensions: 7.75" x 11.75" x 2"
I bought two of these clocks and I absolutely love them! They look exactly like they do on the site and are so fun! My husband likes it because it doesn't make a ticking noise that he can hear. 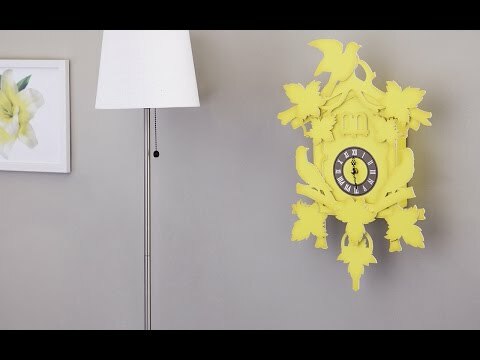 How do you improve on the ornate cuckoo clocks made in Germany in the 18th century? FunDeco did it by taking a real functioning quartz clock, putting it in a lightweight paperboard frame, giving the classic baroque design a quirky update, leaving out the noisy cuckoo, and making their Flew the Coop No Cuckoo Cuckoo Clock right here in the good ol’ U.S.A.
FunDeco began as a family affair. When Founder Todd Meissner saw his father’s printing business falling off, he went looking for a new way to use its resources. With four kids of his own in college, Todd found his inspiration. He started making decorative dorm items from the rigid, environmentally sustainable and recyclable matte paperboard at his father’s company. Today, Todd’s No Cuckoo Cuckoo Clocks are still made in Wisconsin. They make a perfect gift for anyone who’s cuckoo for fun décor.